Our plans have come together for the launch our ‘Train the Trainer’ (Rural Entrepreneurship) programme in Athlone on Thursday 27th May at 15.00 hours. We have colleagues from a number of tourism organisations and training institutions from eight European countries and Canada coming to the launch and other related events. We have invited Ambassadors from each of the countries, Fáilte Ireland, Leargas and Government to our launch. We are excited about this launch as it is a cumulation of work that has been ongoing for the last two to three years. Within the context of our current Leonardo project this is an important milestone and we are working towards accreditation in a further three EU countries. This module is ideally targeted at either 1. rural entrepreneurs who wish to offer training to their wider local communities in the skills of rural tourism/entrepreneurship or 2. trainers who currently operate in the public/private sector to become proficient in training adults in rural areas. 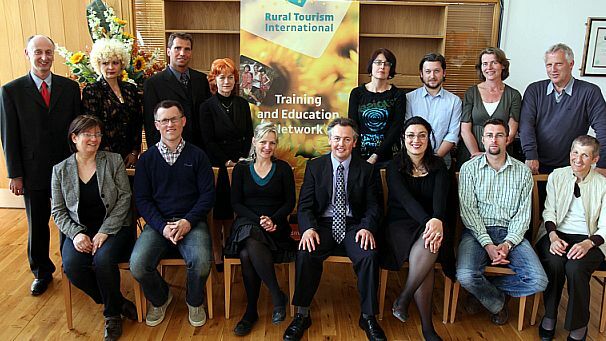 As a network of organisations from a wider variation of bodies internationally we are focussed on developing training to meet the needs of communities specifically within the rural tourism sector. During our planned meeting we will also be endeavouring to develop initial plans for new projects. Some ideas include online learning, training for ecotourism and accreditation of training modules which be delivered by our trainers. With this in mind, we are interested in welcoming new members who wish to become in developing these ideas in to projects for the future. Since this programme of events is happening in Ireland, we welcome anyone who is involved in delivery of tourism related training or involved in delivery of the LEADER Rural Development Programme to come along to our launch. Equally you may be interested in attending our training workshop, which will be delivered by trainers from Bulgaria, Ireland and Romania on the morning of the 27th May. If interested in attending, it is essential that you email John Toland from Cavan-Monaghan LEADER immediately. There are limited places left for the workshop.